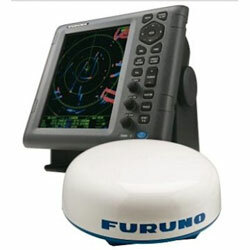 Furuno" s 1835 Radar is a high contrast 10.4" color LCD radar designed for a wide range of vessels including pleasure craft, fishing boats and work boats. This radar offers crystal clear target presentation with automatic Gain / Sea / Rain controls to deliver noise-free radar presentation. The Funuro 1835 can be interconnected with other navigation equipment such as chart plotters and sounders through Furuno's programmable NMEA 0183 interface system, affording operators the ability to expand their boat's system as needed. With a push of the “OFF CENTER” button, ship position can be shifted to a pre-registered point on the screen, allowing the operator to focus on a specific area ahead of or around the vessel without losing track of the position.